The 2015 - 2016 winter season produced the least amount of snow on record, while this year was a mixed bag in the Northeast. Some cities came in below average, while other areas in the Snow and Ice Management Company (SIMCO) service footprint were absolutely plummeted, especially towards the end of the season when Winter Storm Stella barreled through. 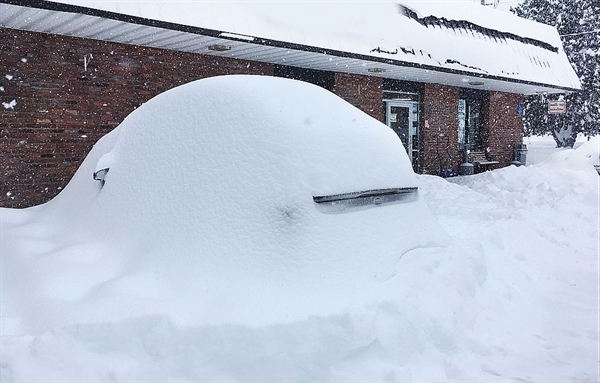 It was this powerful March storm that boosted snow totals throughout our 7-state service area including Pennsylvania, Ohio, Virginia, West Virginia, Maryland, Delaware and New Jersey. Undeniably, the bulk of the winter season was a wintry mix of light to moderate events with northern NJ and PA seeing 10 – 25” above normal snowfall while southern PA and NJ came in with 4 – 8” deficits. When compared to recent years, this past winter had a strong showing but still ended with seasonal temps several degrees on the high side, before March rolled in below normal. 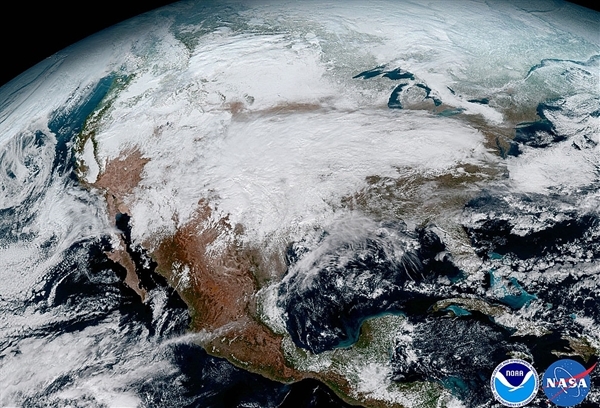 This image clearly shows the significant storm system that crossed North America that caused freezing and ice that resulted in dangerous conditions across the United States on January 15, 2017. November was a relatively mild month which started out with summer-like days in the 70s. That would be the last resemblance to last year’s balmy temperatures that held on well into the holidays. The first decent amount of sleet and snow arrived November 18th-19th. Small to medium sized events took over in the form of wintry mixes, something that would become a trend for the rest of the season. December 2016 bore little resemblance to its 2015 kin. November’s warmth spilled into December’s early days but by the second week, cold temps moved in and several storm events hit northeast Pennsylvania and northern New Jersey. Several smaller, localized snow events followed. By the holidays temperatures in the northeast were up to 10 degrees above normal. On December 27th, record breaking highs reached to 60 degrees in Pennsylvania cities including Allentown, Harrisburg and Scranton. 2017 sailed in on a warm breeze leftover from December, but inland locations soon had to deal with freezing rain showers and sleet, prompting ice control services from salting, to liquid deicers and salt brine applications where applicable. Talk of the “Polar Vortex” returned as Arctic air blew into the region dumping 4-8” of snow in southern NJ and Philadelphia. The east end of Long Island was left to deal with a foot of snow. Southern New Jersey was hit with coastal snow showers at the end of January, giving Cape May 2-4”. Many sites not serviced by Snow and Ice Management Company looked like this after Snowstorm Stella ripped through our 7-state footprint (Ohio, Pennsylvania, Virginia, West Virginia, Maryland, Delaware and New Jersey). February was a mixed bag. After starting with a warm shot, freezing rain arrived on the 7th. The temps then rebounded the next day with Philadelphia hitting 66 degrees and Atlantic City coming in at 71 degrees. Then on the 9th, our seven state service footprint saw a widespread weather whiplash that brought in freezing rain and snow. The storm brought 1-2” per hour snowfall rates in the heaviest spots with gusty winds up to 35 mph. When the storm passed, 6-12” of snow had fallen across the northeast. SIMCO snowfighters were given a break from round-the-clock snow removal and deicing as the remainder of February returned to a warming trend, with only a few lingering small snow events. Records were broken across the states serviced by SIMCO as temps came in at 20 – 30 degrees above normal during this period. Pittsburgh hit 76 degrees while Wilkes Barre / Scranton, PA saw 68. Georgetown, DE reached 77, Beckley, WV, 73, Morgantown, WV, 78, Cleveland and Columbus, OH both hit 77, Dayton, 76 and Newark, NJ realized 74, with all this creating a false sense of spring, as March 2016 would soon rule out. The first few days of March continued to be very seasonably warm. From the 3rd to the 5th, an invasion of Arctic air crashed the summer party and temps fell back into the 30s and 40s. Warm conditions returned from the 6th to the 9th but again were sent away as polar air returned bringing snow squalls on the 10th and 11th. This would turn out to be nothing compared to what was to arrive in just a few days. A significant, historic coastal storm named Stella formed and moved up the East Coast on the night of March 13th and dumped major snow across the SIMCO service footprint for the next few days. Several businesses and attractions in Philadelphia closed on March 14th including the Philadelphia Zoo and the Philadelphia Museum of Art. The Berks Area Regional Transportation Authority and Lehigh and Northampton Transportation Authority cancelled all service on March 14th along with The United States Postal Service closing post offices and cancelling mail delivery for several locations. Schools in Northern New Jersey announced closures and a state of emergency was declared by Governor Chris Christie. In Delaware, Governor John Carney issued a level one driving warning for New Castle County and DMV offices in New Castle County were closed on March 14. Some areas saw over two feet of snow while others encountered several inches of sleet (Sussex County, NJ, was hit with 3.5”) which was a challenge our snowfighters met and persevered, but will never forget. Snow fell at rates of 2 – 4” per hour, driven by gusty 30 – 40mph winds. When it was over, the NJ counties of Atlantic and Cumberland were greeted with scattered coatings while Sussex County had over 20 inches. Prior to Stella, Harrisburg, PA had only 5.5” of seasonal snow fall until that storm left 17.4”, largely accounting for their seasonal total of 23.9”. Here are the highest observed snow totals from each affected state in our service area: Great Cacapon, WV: 12”, Winchester, VA: 9.1”, Vernon, NJ: 20”, Poyntelle, PA: 39.5”, Pike Creek, DE: 4.4”, Mountain Lake Park, MD: 12.8”. 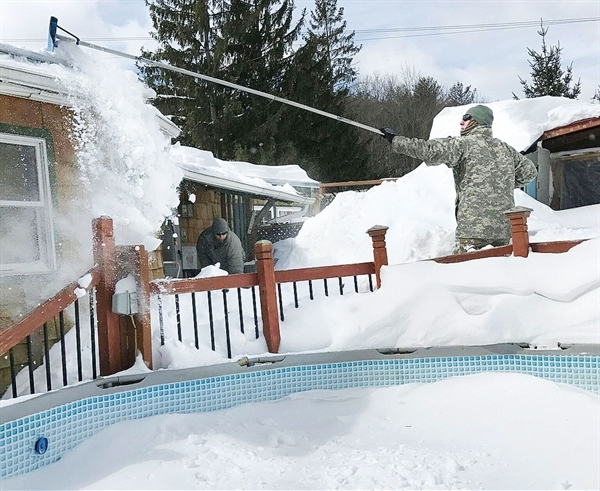 Members of the National Guard clear roofs in the aftermath of Winter Storm Stella. A few bouts of snow showers arrived after the 18th, with a light freezing rain event in far northern locations of PA and NJ on the 26th. One last event March 31st into April 1st affected similar locations with a wintry mix of sleet and freezing rain, however, temperatures were otherwise a bit more seasonable during the second half of the month. Overall, March was the only month to finish below normal during winter, with 1-3 degree anomalies. In fact, the pattern of a cooler March than February had not been seen since 1984.